Thailand Shared Web Hosting. Package: XXS Disk Space: 10 GB Data Transfer / Month: 2 GB Websites: 1 Datab.. Anonymous Offshore Web Hosting. We understand how important privacy is when running online operations and we have build our offshore anonymo..
Offshore Remote Desktop We understand how important privacy is when running online operations and we have build our offshore anonymous hostin..
Thailand Shared Web Hosting. Package: SMALL Disk Space: 15 GB Data Transfer / Month: UNLIMITED Websites: 1&nb.. Anonymous Offshore Web Hosting. We understand how important privacy is when running online operations and we have build our offshore ano..
Thailand Shared Web Hosting. 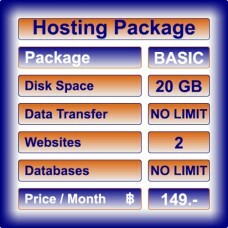 Package: BASIC Disk Space: 20 GB Data Transfer / Month: UNLIMITED Websites: 2&nb..
Thailand Shared Web Hosting. 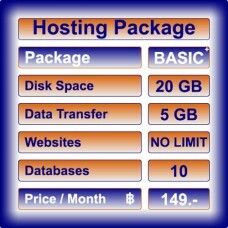 Package: BASIC+ Disk Space: 20 GB Data Transfer / Month: 5 GB Websites: UNLIMITED..
Thailand Shared Web Hosting. Package: LARGE Disk Space: 30 GB Data Transfer / Month: UNLIMITED Websites: 5&nb..
Thailand Shared Web Hosting. Package: LARGE+ Disk Space: 30 GB Data Transfer / Month: UNLIMITED Websites: UNL..
Thailand Shared Web Hosting. Package: XXL Disk Space: UNLIMITED Data Transfer / Month: UNLIMITED Websites: U..
Ready2Start Webshop DOMAIN Package Featuring: Max. Number of products: UNLIMITED Themes installed / choice: 5 / UNLIMITE..